Using his vast knowledge, various formulas, and going even further by stepping into the occult world, an alchemist will transform various elements into gold. Even though this task may not be easy, he's gonna make it with your help if you decide to give a chance to the Alchemist's Gold video slot, created by 2 by 2. It's playable on the Quickfire Microgaming platform, and it features 5 reels and 40 win lines. If the alchemy is something you deem interesting, then take a look at this game, and it'll definitely surprise you with all it has to give. Furthermore, if you'd like to know details, start right away. Step into the dungeon, because that's where you'll find our hardworking alchemist, mixing some potion, and performing all kinds of experiments in order to find the right formula. His ultimate goal is to make gold out of other elements. Of course, he'll not make it at the first attempt. But as he is a patient man, he'll not be discouraged. When you finally locate him, he'll be surrounded by the darkness. He is completely used to it now. In this obscure place, there is a lot of curious stuff. One of them being a crown, a crest, a cup, a pendant, and a few other peculiar things. 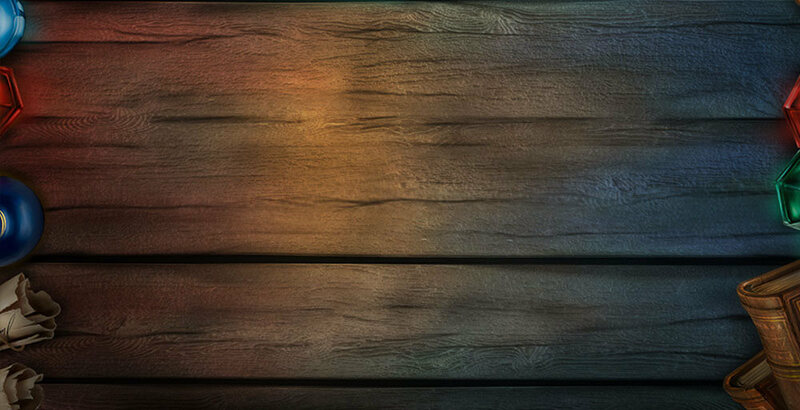 Among more common symbols, we'll find clubs, spades, diamonds, and hearts, changing to gold when it suits the alchemist. While he works his magic, an optimistic soundtrack is being played in the background as the motivator. As a little helper, there is also one more symbol, and it's a purple gem with a gold stand, supporting it. This gem, occasionally becoming golden, is the Scatter. At last, we have the Alchemist, and this happy looking guy will perform splendidly. He is the Wild, and if he appears stacked, if he's in the mood, he'll maybe transform into one card, occupying the complete reel, and transform other symbols around him into gold. During the game, the Alchemist will occasionally land on the reels 2, and 4, and if it's stacked, there is a possibility for the additional magic, as mentioned above. The Wildcard can replace any symbol but the Scatter. With 3 or more Scatters, you'll be offered between 2 option. Both of them contain between 10, and 20 free spins, depending on the number of spins which triggered the Free Spins Bonus. 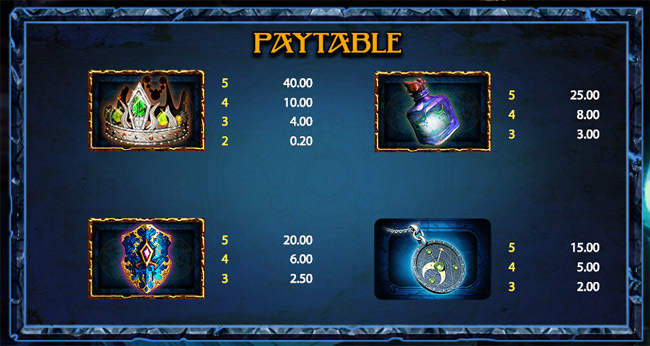 The first choice is the free spins entailing symbols with the gold paytable, which is 4 or 5 times bigger than the usual paytable, it differs from symbol to symbol. The other presented option is the Easy Feature Free Spins, and it brings the additional perk of expanding any Wild on the reels 2, and 4, and the rest of the symbols into gold ones. 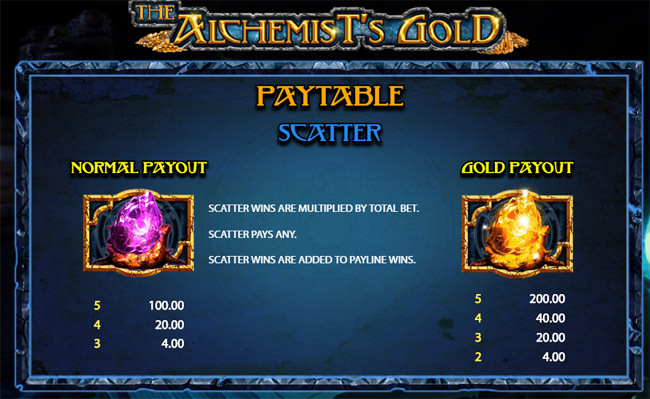 If you get 3, 4, or 5 Scatter, more free spins will be awarded. One more feature is added to this dungeon, and it's called the Mystery Feature. It means that every reel has a mysterious place. And these places can be replaced by other symbols in the game, except the Scatter, and the Wild. Beautifully drawn, and rich with creatively made features, the Alchemist's Gold video slot provides with the ultimate entertainment. And if you'd like to be part of it, don't hesitate to give him a call in his dungeon. Unlike other moody men of his profession, he looks quite happy and would be delighted for you to pay him a visit. And even though it can take time to unlock some features, and make gold, there will other opportunities on the way to improve your situation. Therefore, if you like all the above, try the game, and have fun by doing so.